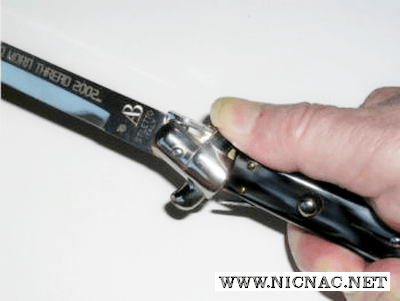 Italian Switchblade Stiletto Knives Information - Blade Descriptions and Pictures - Here you'll find more information on the knives we carry from Maniago, Italy. We're just building this page, so please be patient, however, if you have any specific questions, please feel free to email us at sales@nicnac.net! All Switchblades and stilettos are shown with average overall open length in inches. Also, FYI, the term stiletto actually is a dagger or knife with a long slender blade and needle-like point. Also, almost ALL of our Italian knives come from Maniago, Italy where they have been hand crafting these knives for generations! Here's a picture of the 3 most popular Italian switchblade knife styles.